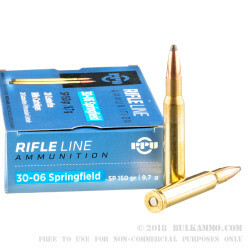 Prvi Partizan's 30-06 ammo is a solid all-around round that's a fantastic value relative to some of your other options out there. 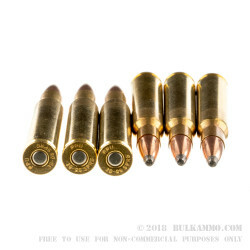 This brass-cased ammo is loaded with a 150 grain soft point bullet. That projectile is sophisticated enough that you could use it for hunting small to medium sized game, like whitetail deer. 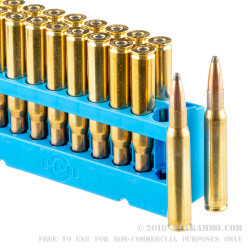 But these rounds are also cheap enough, you might consider using them as range rounds for training or just plinking. 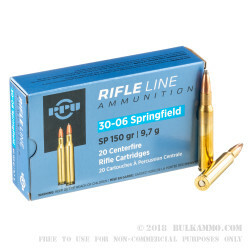 When you order this 30-06 Springfield ammo, you'll get a single box with 20 rounds inside ready to load into your rifle and fire.